< Call this a Collage? Great idea – I frequently overlay scribbles while drawing from the tv etc (or could try the computer) – be possible to incorporate this with collage and wash…..
Surrealist poetry! as well as art. Definitely fun. A great fun collage!! Thank you for visiting my blog, I shall look forward to seeing more of your creative work! Thanks, Evelyn, and I’m really looking forward to yours as well! Thanks for looking around and making comments; I really appreciate that! I wanna mention too that the best part is it was all totally unplanned. In my life, I’m such a planner. This really allowed me to let loose and see what develops, another lesson from art I could really take into my life! Yes! I love abstract work for this. I think there is as much skill in helping the image emerge in abstract, intuitive work as there is in illustrations that are planned. There is a balance between the two. I.like watching you explore the balance. Just an observation but it seems like your sense of humor emerges in the looser work. Like the doodles…too. Lol that’s a great point, and I’m so glad you shared it, as I have so much to learn about all of this! I think that’s part of why I love it so much, though. I really appreciate your comments; they’re very helpful as I try and move forward as fast as I can to make up for lost time! Thanks, Marika. Those kitties!!! 😅 Love it!!! Oh I hope you do, I’d love to see it! Thank you, Tracy, I really appreciate that and I’m so glad you enjoy it! I’m not laughing… umph…urr.. heehee… haHaHAHAHAHAHAHA! Dang! Holding that in is hard. I’ve thought about making greeting cards in the past, and I think I’d really enjoy it! Thanks, that’s a great idea. I’d like to write verses also. Hehe, it’d be a kick! Thanks again for your kind comment, Jean! Collages like this are a great way to get the juices flowing. 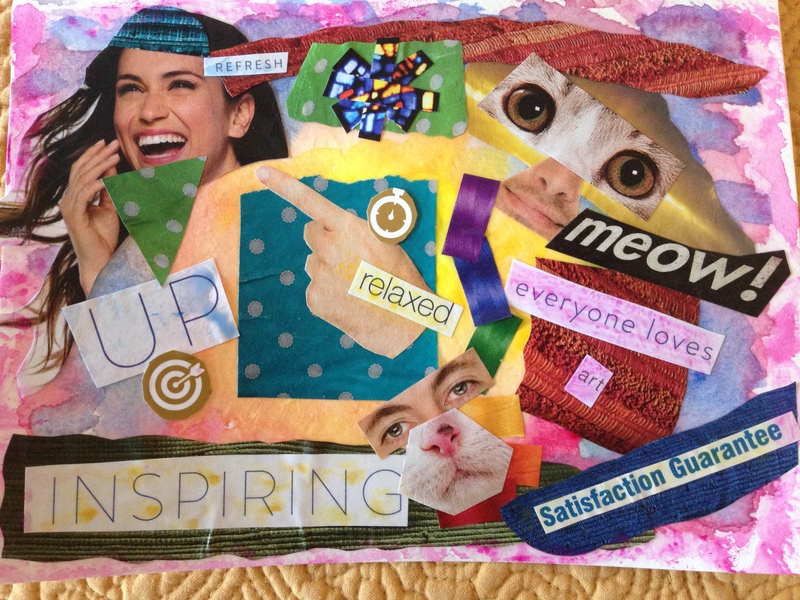 I used to co-run a mixed media group and we would periodically have 7 day one magazine challenges, and you posted the challenges you made from one magazine. Some of them were SO cool! Ooh that’s a cool idea! !